Paint a picture of Europe’s sustainable thinking, knowledge and experiences. That is one of the assignments for a ‘green performing city’, Art-Epi, which will be kaunched in Denmark on 18 August 2013. The project aims to find new ways of cultivating innovation and development in the sustainable sphere – socially, scientifically, artistically, culturally, tourist- and business-wise. 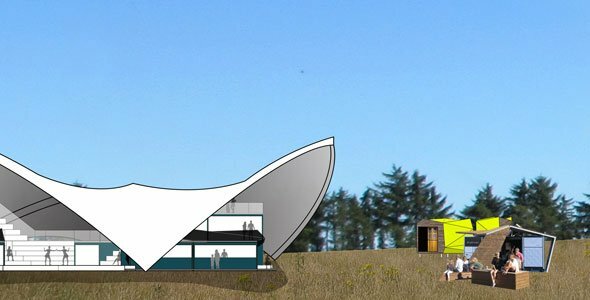 An interesting experiment blending arts, architecure and science is taking shape in the centre of the Danish mainland, Jutland: a moveable micro-city of 100 inhabitants, organised around a series of sustainable, environmental and resource-conscious building activities, lectures and workshops. This year, Art-Epi will roll out a laboratory and a pilot project where sustainable thinking of the future will be stimulated and co-created. The micro-city will rise on the moor of Præstbjerg in Mid-Western Jutland from 18 August til 19 October 2013. The goal is that Art-Epi, with all its initiatives and ideas, will travel in Europe the next couple of years. After that Art-Epi will return to Denmark and visit Aarhus when the city becomes the Cultural Capital of Europe in 2017, gathering and presenting all the experiences and inspirations from four years of travelling. world of science, creating interdisciplinary networks locally, regionally, nationally and internationally on a platform where music, theater, visual art, beekeeping, science, carpentry and farming can meet and inspire and learn from each other. The green performing city will have a performance venue, a communal soup-kitchen, and many other facilities enabling it to host events on a daily basis. Visitors are welcomed to walk around on the site and to join the daily activities. They must bring with them everything they need during their stay, and they should have a focus on sustainability. Starting up in Jutland, the micro-city will be like an epicentre right in the middle of group of collaborating cities. “The word Art in Greek means ‘crafts’. Everyone has his or her own ‘craft’ to help create new ways of thinking, acting, producing, concept development and innovate with a focus on sustainability. and The Stove have launched a call for proposals and partners for Scotland’s first Environmental Art Festival Scotland. The deadline for all strands is Thursday 22 March 2013. 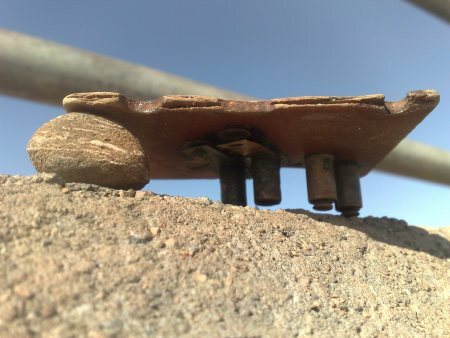 Open Call for Ideas – ideas for artworks that connect aspects of land, sustainability, energy, coast, rural living, Biosphere, Dark Skies, climate change, ecosystem services, transport, etc. and are relevant or connected to Dumfries and Galloway. These could be small or large ideas. Proposals are invited from any discipline. Ten ideas will be selected to receive small grants towards their development. They will be included in the Environmental Art Festival in some form (depending on the stage of development). Venues, Places, Organisations – Wide Open is interested in hearing from Venues, Places or Organisations with existing or planned activity that fits with the themes of the Environmental Art Festival. Culture|Futures Clubs gets Council of Europe Cultural Event Label 2012. The Council of Europe Cultural Event label recognises exceptional and innovative cultural and artistic projects which address key challenges of today’s European societies and convey strong messages related to the Council of Europe’s mission and values. Call for established and emerging artists, design professionals and collaborators to create works of environmental art in the public domain. Opportunities for installations that go beyond interacting with the urban environment and become remedial interventions. The Environmental Artist-in-Residence (EAIR) program encourages artists to have beneficial impacts on the urban life through creation of art that is scientifically relevant, meaningful and beneficial environmental art. The second edition of the CSPA Quarterly is now open for submissions. This issue will focus on international eco-policy, policy’s effect on the arts, and the arts’ effect on policy. The issue will feature news and events from COP15, the UN Conference on Climate Change in Copenhagen this December. Articles from all nations are welcome! The publication will explore sustainable arts practices in all genres (performance, visual art & installation, music, and film/video), and will view sustainability in the arts through environmentalism, economic stability, and cultural infrastructure. The periodical will provide a formal terrain for discussion, and will evaluate diverse points of views. The deadline for consideration is December 22, 2009. We are pleased to announce the first edition of the CSPA Quarterly! This edition of The Quarterly explores sustainable arts practices in performance, visual art & installation, green touring, and eco-policy. 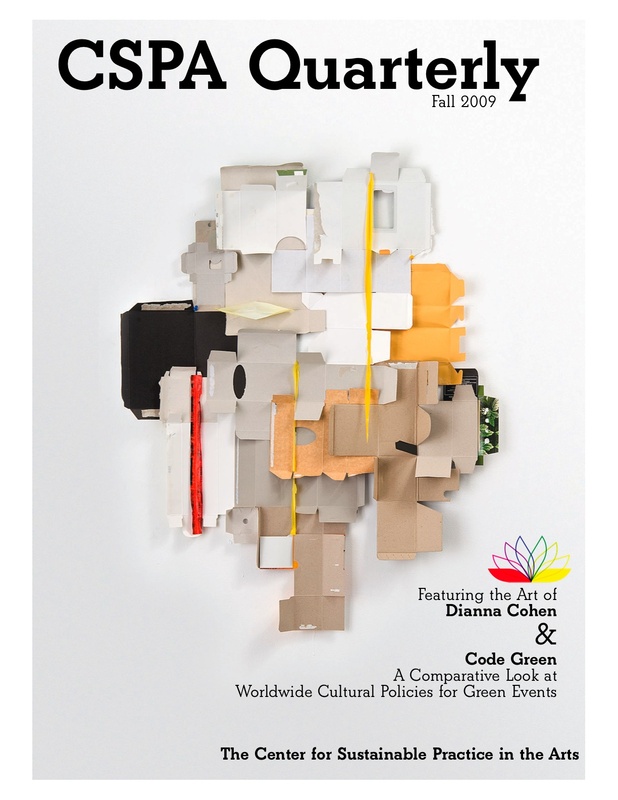 Articles include ‘Code Green: A Comparative Look at Worldwide Cultural Policies for Green Events,’ by Sam Goldblatt. This edition’s featured artist is Dianna Cohen, a Los Angeles based multi-media artist who is best known for her works using recycled plastic bags. Other contributors include Moe Beitiks, Linda Weintraub, Patricia Watts, Thomas Rhodes, and Olivia Campbell. The point is to consciously and deliberately appreciate stuff – all stuff. From our bodies, minds, creativity, each other, life itself, the world around us and establish a deeper appreciation of time itself. And it got me thinking. … doing things well requires rigour and thought and that takes time… But political, social and environmental changes happen relatively fast and need practical responses. The arts need to consider this as much as ever before – perhaps more. How can the soft skills and soft power of the arts be shared more widely and do they have practical application? What do the arts do well? What could the arts do better? For example, should visual art be more democratic and what would cultural democracy look like? * I heard this Marx quote again yesterday, when my iPod shuffled to an old version of the BBCs In Our Time (2005) featuring Karl Marx as winning the ‘greatest philosopher’ vote, here’s the link.